Several articles over the last year or two I’ve read quoting people he’s played with say he’s shot from the high 70s to the low to mid 80s during their round, which largely bears out in the stats you show. 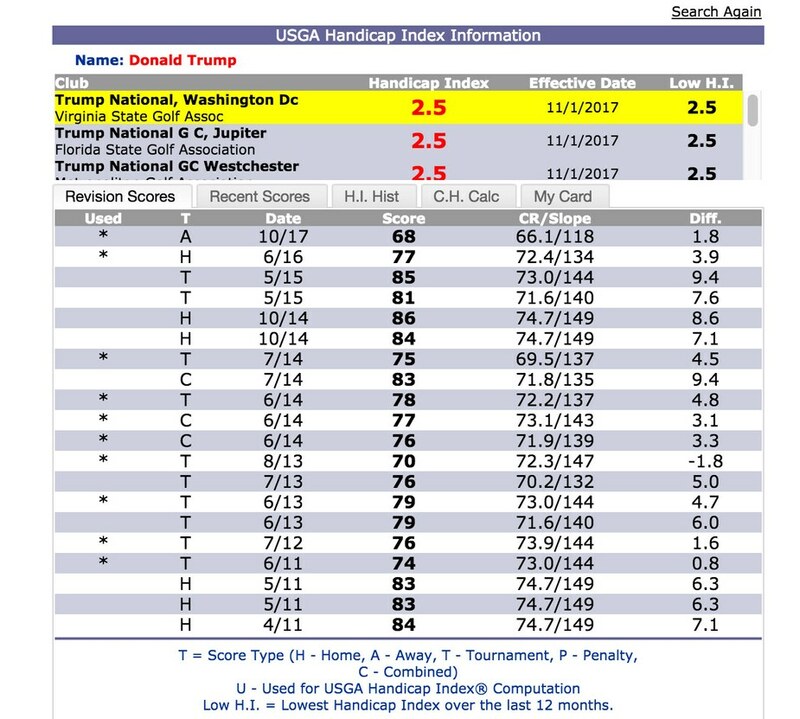 He probably plays a lot of casual rounds that include gimmies, etc., that can’t be posted for HC (especially now as the president, but also as a private citizen doing business on the course). At least he keeps a handicap. I don’t recall that any of our last 4 golf playing presidents have a registered HC. I’d be a lot more concerned if he was a sandbagger! Still, Bob, taking six YEARS to post his twenty lowest scores is beyond suspicious, to my way of thinking. As for the other presidents who don’t keep a handicap, they’re just out there to have fun. Handicaps are for equalizing competition.